“Twisted Entities. Contemporary Polish Art” is the title of the exhibition at the Leverkusen Museum Morsbroich which presents works by Wojciech Bąkowski, Mirosław Bałka, Michał Budny, Aneta Grzeszykowska, Zuzanna Janin, Maciej Kurak, Robert Kuśmirowski, Agata Madejska, Jan Mioduszewski, Anna Molska, Marzena Nowak, Konrad Smoleński, Monika Sosnowska and Honza Zamojski. On the exhibition we can see the videos, installations, and sculptures which are associated with the idea of the „twist” and deformation. We had the pleasure to talk with the curator of the exhibition – Stefanie Kreuzer, who showed at Leverkusen how vibrant the Polish art scene is. How did the idea of “Twisted Entities” exhibition arise? Why Polish art scene? So this happened to me several times with Polish artists and their work. I felt deeply attracted by their way of how to express. Out of this first impression I started a research about the Polish art scene. But the idea of “Twisted Entities” arrived later together with the specific works shown in the exhibition. It cannot be coincidence, that nine artists out of fourteen taking part in the exhibition have been earlier nominated for an award “Views” granted by the Deutsche Bank Poland and the Deutsche Bank Foundations. Three of them became the winners of this prize. What was the influence of the previous subsequent choices of jury on selection of artists for this exhibition? Last year you came to Poland on the initiative of the Polish Institute in Dusseldorf. What were your impressions regarding the Polish artistic scene after this visit? When I visited to Poland last year (not the first time), I had the privilege to be invited by the Instytut Adama Mickiewicza because the Polish Institute in Düsseldorf offered me the possibility to ask for a “curators tour”. So I arrived in Warsaw and a “tour” was prepared for me – Warsaw, Poznan and Lodz – with a lot of appointments with colleagues, institutions, galleries and artists. This made it quite easy to get into the place. I felt an intense discourse between the actors of the art scene about contemporary art combined with the idea of an existential need to produce these artworks on the side of the artists. There was a high energy of discussing art in relationship to essential questions – far away from the superficial consume of artworks. Did any artistic phenomenon pay your special attention during that stay in Poland? Of course, there were a lot of interesting phenomenon but I remember that I saw a strange project at the Centrum Sztuki Wspolczesnej Zamek Ujazdowski – it was a show about the Akademia Ruchu. – I think. I really liked the subversive style of the works. The exhibition presents a specific picture of the Polish current art, which from one side is strongly linked with socio-historical context and from the other side is very dynamic, flexible towards “existing elements”. The artists study the reality, check the rules governing it by the act of deconstruction, overturn and leading it to the decay and then they establish a new version of the world around them from these fragments. Do you think that this is a feature that characterizes the current art in Poland? I don’t believe that in our times there is something like “Polish” or “German” art. There are so many ways of artistic expression, so many different themes and concepts that’s quite complicated to think about a common style or argument. But there is a leitmotif which leads trough the show and this maybe creates the idea of “this is Polish art”. But I am aware, that there are many other possibilities to interpret the art scene. Developing the show is more like designing a hypotheses or offering a model of thinking which seems interesting, convincing or discussable. How do you think, what is causing this trend? How does it look like in comparison to the current German art? Can we find some common points? I see a difference between designing a hypotheses and detecting trends. So it’s difficult for me to answer this question. The Morsbroich Museum has exhibited the great classics of contemporary art such as Robert Motherwell, Yves Klien, Lucio Fontana. There is also the impressive collection of art. You have the works of artists connected with Nouveau Realism, Op-Art, Zero Group, Gerhard Richter and the works related to the new media. Having in mind your current interest in the Polish art please inform if you have some Polish art in your collection? The Museum Morsbroich was founded after the Second World War with the dedicated aim to show contemporary art. So when they showed Fontana for example it was 1962 – so it wasn`t that classical at all. It became classic only later. We had a show with Wojciech Fangor in 1964 and we bought a work of him for the collection. In the collection there is also a work of Stazewski. In 1978 we made a show with drawings of 15 polish artists. The exhibition was organized by the Museum Sztuki in Lodz. I am working in the Museum Morsbroich since 2007. Since that time I was thinking about how to connect our actual program with the history of the exhibition and the collection of the Museum. Unfortunately the economic situation of the city of Leverkusen has been problematic for more than 15 years. So we don’t have the possibility to buy works for the collection – which is not only a problem for the existing collection but also for the idea of collection as well. In our exhibition program we try to create links with history of the institution. So there are several focuses we were thinking about. One was the attention towards the Polish art. 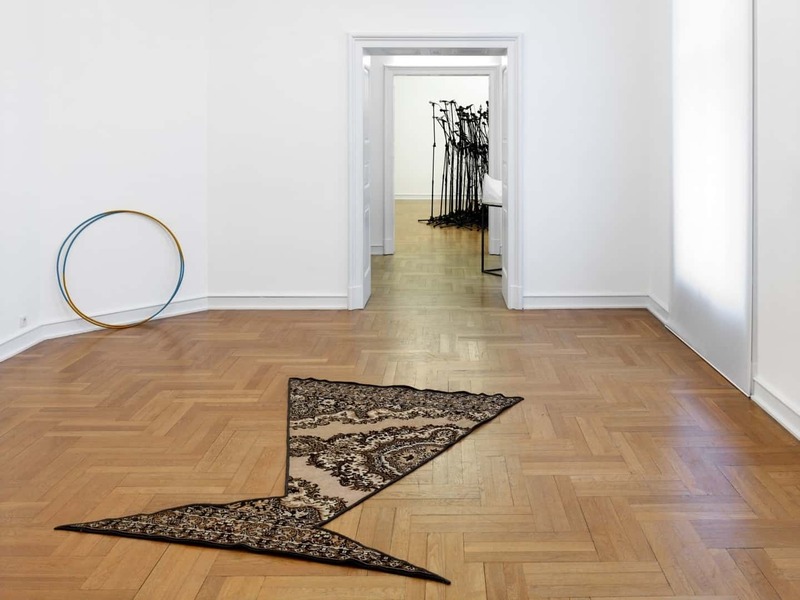 But this doesn’t mean that the show Twisted Entities is only motivated by the history of our place, it`s mainly motivated by the strong and interesting positions of the contemporary Polish art.